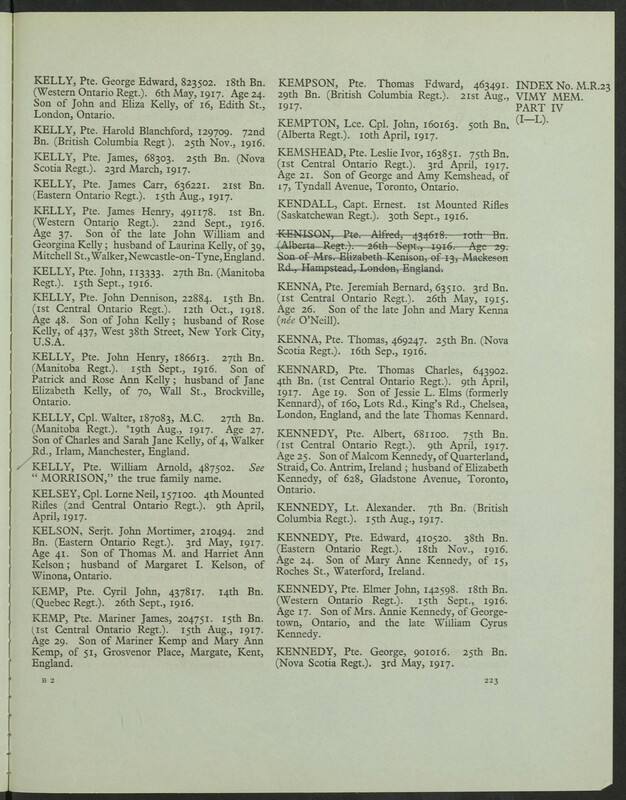 Son of Mrs. Annie Kennedy, of Georgetown, Ontario, and the late William Cyrus Kennedy. From Attestation Papers: Apparent Age 18 years 9 months with a date of birth of March 09, 1897. Ages listed at CVWM and CWGC as 17. At this time there are no digitized service records at the LAC but the 76th Battalion does have a post-war history and nominal roll that outlines the circumstances of Pte. Kennedy’s transfer to the 18th Battalion. On August 1st, word was received from Headquarters that the 76th was to supply a draft for re-inforcing the Overseas Battalions of 5 Lieutenants, 8 Sergeants, 2 Buglers, 8 Corporals and 232 Rank and File, a total of 255 all ranks. Though the O.C. would have greatly preferred to have taken his Battalion overseas intact, yet the need of fresh drafts of men to fill up vacancies caused by casualties was so great, that steps were at once taken to select, train and equip the quota asked for. Lieutenants H. C. Young, W. O. Brown, W. H. Fair, A. C. Bowles and C. E. H. Thomas were selected by Colonel Ballantine as Officers of the Draft, but owing to the resignation of Lieut. W. H. Fair, the name of Lieut. N. Nicholson was submitted in his place and accepted, and after two months strenuous training, the Draft left Camp for England on Thursday, Sept. 30th. The evening was spent in various forms of amusement, a perambulation of the Camp being a leading feature, and next morning saw the Draft embark for Toronto and “Further,” leaving us a little sad, a trifle jealous because we were not going for a while. They were a fine body of officers and men, and will undoubtedly play their part with credit to the Battalion whence they were drafted. On arriving at Toronto they were met by the Chaplain who wished them God speed and said good-bye as they entrained for Quebec. Source: Pages 37 and 38 of Historical Record of the 76th O.S. Battalion C.E.F. 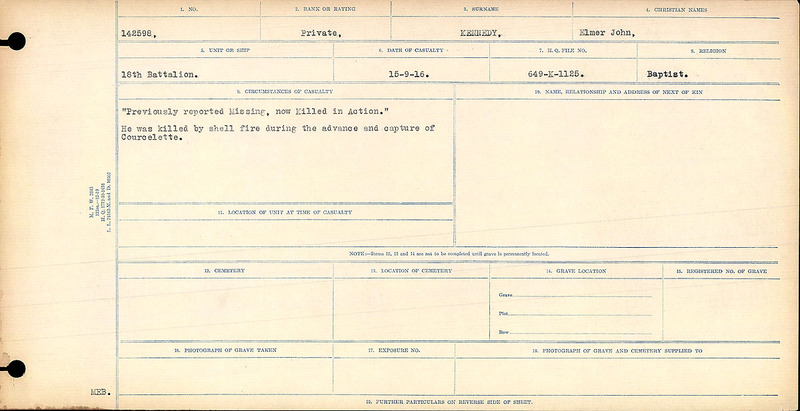 “Previously reported missing, now Killed in Action.” He was killed by shell fire during the advance and capture of Courcelette.